A LIGHT DUSTING OF snow covers the garden as I sit writing this story; my mind wandering to warmer days, an offshore breeze and the chance of facing up to a shark. I thoroughly enjoy shark fishing, for me it's undoubtedly the most exciting form of big-game angling available in British waters, and while it's a waiting game there's some great fishing to be had providing you know exactly what you are doing. Having hooked blue sharks to 165lb and porbeagles to a similar size in recent years from the waters off West Wales, I guess you will understand why I am eagerly looking forward to that first click-click of my reel’s ratchet as the summer approaches. So what exactly is this shark fishing game all about? Is it simply a case of setting a bait to work beneath a colourful balloon and then drifting the open sea until a fish finds it? Is it all simply a case of luck? Well, the answer is no. Sharking is all about working for your fish with success only coming from a hard-earned combination of effort and thorough knowledge of the species. You need to understand their feeding habits as well as the way the way it's distribution is affected by the variances of tide, weather and the distribution of fodder fish these apex predators eat. Clearly it takes time to gather the knowledge, and while it will always be possible to successfully catch a fish or two provided you are fishing in near enough the right area, experience is the difference between hooking just an occasional fish compaed to consistently releasing fish on a daily basis. So the first thing you must do is book a skipper who is an experienced shark man, and not go with a skipper who takes anglers on shark trips. The weather, bearing in mind most shark trips are well offshore, will always is a stumbling block, and I think it's fair to say that a 50 per cent cancellation rate is about average. With this in mind it is never a bad idea to book a few days fishing spread out over a period of weeks, which increases the odds of actually getting a afloat in what might be a short window of opportunity measured in weeks rather than months. In West Wales, for example, you'll be looking at mid-July to the end of September, though recent evidence points to encouraging possibilities before and after the normally accepted shark fishing season. When booking a trip establish the ground rules with the skipper. Make it clear you want a shark trip, bearing in mind that conditions can change due to the weather. In many areas, and West Wales is a good example, the weather might well be totally unsuitable for venturing offshore and drifting for sharks, but fine for fishing more sheltered marks closer to land. Not surprisingly, many boat skippers will be keen for you to still take the day and fish for other species, so you need to be clear in the event of cancelling the day due to any bad sea conditions. ONCE you have reached the fishing grounds and started the drift it is a great temptation for everyone to get their hooks baited and in the water as soon as possible, but I advise you to organise the boat deck and how the rigs will fish. Ideally there will be no more than four of you fishing at a time, and in order to avoid tangled lines and to ensure the baits are fishing at varying depths and distances it is important to coordinate the positioning of each line. If you are fishing four rods the outfit working furthest from the boat should be set to fish the deepest, the rod closest to the boat set to fish just beneath the rubby-dubby bag. The skipper will give more accurate advice, but if you follow the following game plan you'll not go too far wrong. Start by setting the furthest line to fish about 100 yards away from the boat with the bait fishing down 100ft in the water. The next rod should be set about 75 yards back with the bait fishing about 50- 60ft down. The third rod should be about 50 yards back with the bait fishing at 20-30ft, with the fourth outfit working just below the rubby-dubby bag, or more or less beneath the boat. Blue sharks in particular often swim all the way up the rubby-dubby slick and appear alongside the boat looking for a meal. Sometimes it's even the rubby-dubby bag. Under ideal conditions it may be possible to fish an extra rod, but remember the more lines you have out the more chance of a tangle and losing a fish. Likewise, if things are quiet and you find you are tempted to bottom fish for other species, Sod's Law clearly states that as soon as you become pre-occupied doing something else, that's the time you'll get a run...and miss it. I fish 30lb mono in conjunction with a 30-50lb class rod for almost all of my UK shark fishing, and with this combination I am confident of handling any shark I am likely to hook. The key in fighting a shark on balanced tackle is to ensure the drag on the reel is correctly set. Assuming you are using a lever-drag reel, then the ideal setting at the strike position is 25 per cent of the breaking strain of the mainline, or in this case 7lb 8oz. Forget using braid for shark fishing. Accurately setting the clutch is one job that certainly should be done on dry land using a decent set of scales. If many of you have never set a reel clutch accurately, then you'll be surprised at how heavy 7lb 8oz of drag is, but, trust me, even a relatively small shark is easily capable of rapidly ripping line against such seemingly high resistance. With experience you should be able to gauge drag settings approximately without a scale, but at first I suggest you either use a scale or ask the skipper to set/check your drag. FISHING on the drift with the reel in free spool, ratchet switched on is the classic way to fish for sharks and there is nothing more exhilarating than the click, click, click of a ratchet as a fish plays with your bait prior to swimming off. Equally there is nothing more annoying than the persistent click, click clicking of a ratchet that gives line every time a swell or wave rocks the boat. Assuming you are using a lever-drag reel this can be avoided by gently easing the lever forward so as to apply just enough drag to prevent anything other than a run taking line off the reel. For obvious reasons, it is advisable to clip your outfit to the boat's railings or ensure it is held secure in a rod-rest. Runs vary from fish to fish and range from heart-stopping, adrenaline pumping, full blown screamers as a fish takes a bait and swims off, to others where the fish seemingly plucks, pulls and plays with a bait for what can seem like an age. 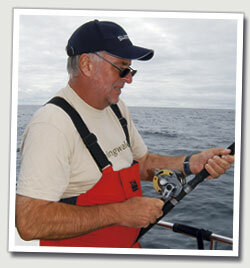 Experience counts for everything and if you are new to shark fishing you should listen to the skipper. 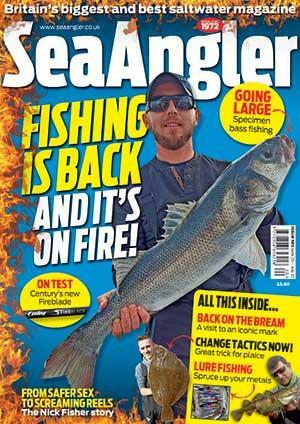 Forget the much quoted rubbish about letting the fish run, stop, then hit it on the second run. That policy will only end up in deeply-hooked fish, which should be avoided at all costs. I'm convinced the time to hit a run is as soon as the fish starts to swim off. If the run is fast set the hook by first pushing the lever- drag to strike, allow the line to fully tighten, then firmly set the hook with three or four short jabs with the rod. Imagine knocking a nail into a block of wood; short taps are far more efficient than one firm bang. If the fish is playing with a bait or only swimming off slowly, again push the lever to strike only. This time wind the handle swiftly until the line is tight, pretty much to the point where the clutch starts to give line, and only then set the hook as above. 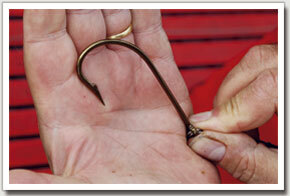 Attempting to set a hook before all the line is picked up will result in fish dropping the bait. THE shark is pulling hard...but don't panic. The idea of shark fishing is to enjoy the moment while remembering that the earlier you can release your fish the better, which is why I use 30lb-class boat tackle. Provided your drag is set, your knots are sound and the other anglers keep their lines away from yours, in most cases once a fish is firmly hooked you should get it to the boat. Keep the rod bent at all times to maintain pressure on the fish, avoid excessively fiddling with the drag, especially in the early stages of the fight and never try to stop a fish taking line with your thumb on the spool or attempt to wind when a fish is taking line. Follow my advice and the result should be the successful release of a shark. If you will be hiring the boat’s tackle then all you need to provide is suitable clothing, being sure to cover all eventualities regardless of the forecast. Take some food and drink and turn up on time. If you will use your own tackle, then I advise you to do as much preparation as possible before you step aboard. There's nothing quite like a heavy swell, a sloppy sea and an occasional whiff of diesel or rubby-dubby while attempting to tackle up to turn even the strongest stomach. The best shark skippers provide a quantity of frozen rubby-dubby and a few hook baits to get you started, but on most days you'll invariably start by looking for some fresh mackerel bait, so be sure to find out whether you'll be using your own tackle to feather for mackerel or will you be able to use the boat’s gear. If you haven't seen a six feet-plus shark circling or spinning by the boat you haven’t lived! With the shark season now in full swing, Dave Lewis shows you how to set up for a blue, porbeagle shark or possibly a thresher or mako! SHARK FISHING HAS enjoyed a massive resurgence in popularity in recent years but to effectively hook, play and land these hard-fighting predators you need strong tackle. Be realistic about the fish you are likely to catch and gear up to fish for specimens in the 75lb-300lb range, rather than 1,000lb-plus great whites. The hook is the contact point of any shark trace and for British fish I would select a size 10/0 bronzed Mustad 3406, flattening the barb with a pair of pliers. By flattening the barb you will be able to drive the hook quicker and deeper into the fish’s mouth and, more importantly, be able to release it faster. Keep the line tight and your shark shouldn't get away. Use a bronze hook, never a stainless steel one, then if you have to leave the hook in the fish it has a chance to corrode and finally fall free. Once a stainless hook goes in, it usually stays in and won't rot away. THE hook is crimped to a 3ft length of Mason 49 strand, 175lb test stainless steel wire, available from Veals Mail Order. At the other end of the wire securely crimp a strong, high quality swivel; I use a size 5/0 Mustad 77501 rolling swivel. To the other end of the rolling swivel I tie a 20ft length of quality, clear, 250-300lb mono, which is what's called a rolling trace in shark circles. Most sharks have a nasty habit of rolling them themselves up in a cat's cradle of line, and if you use a mono that's too light the fish’s tough sandpaper-like skin will rub through the line and break it. A second size 5/0 swivel is crimped to the other end of the rubbing trace. When securing crimps in both mono and wire, always ensure you use the correct size crimp for the size of wire or mono you are using. If you use the wrong size crimp, then you will be seriously compromising the overall strength and integrity of your trace. A good tip is to always tie a double overhand knot in the wire or mono at the attachment point, prior to fitting the crimp. This provides double line insurance against abrasion at the point of contact, plus the knot will jam in the, hopefully unlikely, event a crimp starts to slip under a sustained heavy load. The trace is attached to the main reel line by using a high quality biggame link swivel, ideally tied using a double line Bimini twist or spider hitch at the end of the reel line. These links are very expensive but compromise on quality at your peril. The double line attachment provides the very strongest knot strength. 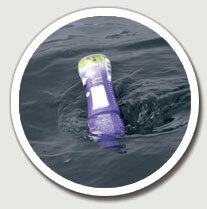 SHARK baits are fished at various depths, held in position by either a balloon or plastic bottle. 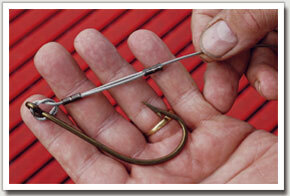 There are several ways that these can be fitted to ensure the bait fishes at the right depth. Most incorporate a stop knot tied to the line, in exactly the same way as when fishing a sliding float for wrasse or mullet. I use a very small swivel link clip threaded onto the mainline after a bead. The knotted end of an inflated balloon can be secured to the clip, with the mainline sliding freely through the swivel until the bead comes up against the stop knot. Another good tip is to use a 1-6oz barrel lead, depending on the depth you want to fish your baits and the speed of drift, to prevent the bait rising towards the surface and into the reach of diving gannets.